My list of interest in SQL Serer 2016 RTM CU6. Especially valuable because even though SQL Server 2014 SP1 was made available slightly after RTM CU6, it did not include all of these fixes at the time. This is because SP1 was built on a base of SQL Server 2014 RTM CU5. My list of interest for SQL Server 2014 SP1 CU1 fixes. Here's my list of fixes on interest for SQL Server 2014 SP1 CU2. You probably won't learn anything from this post. Gonna try to prefix titles of such posts with "LIST" from now on :-) This post is just a list of kbs I am especially interested in. Build 12.00.4427, SQL Server 2014 SP1 CU3 became available October 21, 2015. These are the fixes that I have a particular interest in. Performance Pitfall - Act III: the Shyamalan twist!! Paul White (@SQL_kiwi) was willing to take a look at this, and gave it a very thorough treatment in the blog post below. Thanks, Paul! The last few days I've provided some details of my recent testing of SQL Server joins on NULLable columns. The primary key in the first column is an increasing integer, step 1. I'm using 2012 compatibility mode today, so rather than the 600,000 rows I used with 2014 compatibility mode I have just 72048 rows. Still going to use 32,000 rows in my X_2 table. But here's my gimmick for today. In the 32,000 rows of table X_2, I'm going to vary the number of NULL values. No big trick to doing that - just use a CASE statement with a MOD operator to assign value of 1 (or NULL) when MOD N is 0, ELSE NULL (or 1, as the case may be to get the desired count of NULL values). 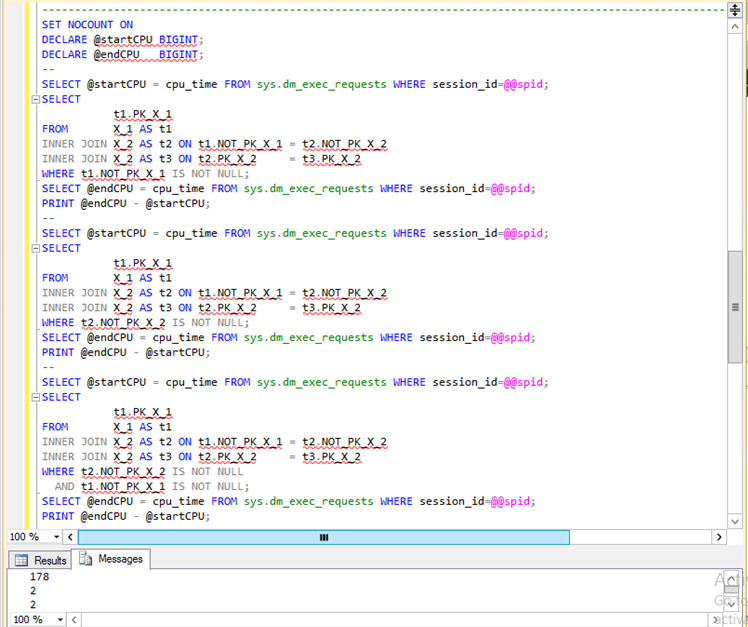 In my first post on this investigation you'll see the basic code I'm using to populate these tables. So - what happens to execution time of the query as I change the number and distribution of NULL values throughout the X_2 table? As the number of NULL values in the second column increased (while maintaining a total row count of 32,000), query CPU_ms dropped in a fairly linear fashion. Makes sense - as the number of NULL values increase, the join has less work to do - because NULL values can't join unless you do something tricky. Ready for the Shyamalan twist? Maybe it looks like I went all the way to 32,000 rows in the graph above. I didn't. Let me dramatically zoom out to catch what happened at 32,000 NULL values and ZERO non-NULL values. So... SQL Server isn't treating the query the same without the implicit NULL exclusion that accompanies the join on the NULLable columns. But it doesn't REALLY cause a problem unless the column has only NULL values. And then, only after a certain number of rows in the table. And I haven't been able to tease out the problem unless I've got at least two joins. In yesterday's blog post I introduce my X_1 and X_2 testing tables. In column two of each of these tables, NULL values are extremely frequent by design to reproduce this performance berserker. 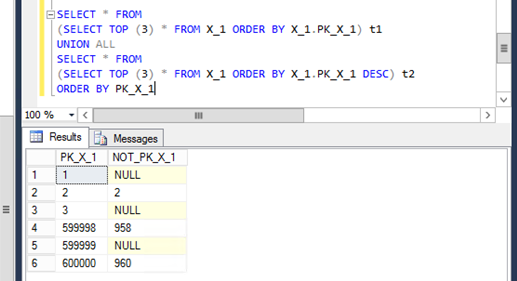 I maintain that the basic problem is one of algebra - although the joins by definition excluded NULL values in the join columns, for some reason SQL Server treats the query differently when the NULL exclusions are made explicit. I'll get to that later. First I want to turn to the other area of interest - predicting scaling behavior of this query when it does the wrong thing. 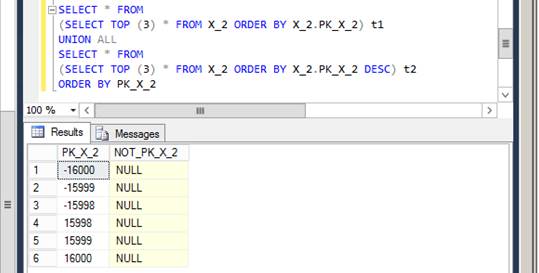 Does this query with 2012 compatibility mode scale along two different linear patterns, as was seen in SQL Server 2014? Yesterday I used an X_1 table of 600,000 rows and an X_2 table of up to 32,000 rows to demonstrate the two linear scaling functions for the query as X_1 maintained constant row count and X_2 rowcount varied. So... here's how CPU_ms varied with X_2 rowcount against an X_1 table with 72,048 rows. And... here's a close-up of that very interesting area where there's a switch between the two linear functions. So... some pics of the plans are coming. And other stuff. But I wanted to get this posted before I doze off for the night. Here's a reminder. Yeah, the scaling of the query is interesting - I want to do additional work in the future to see if this type of pattern shows up in hash joins of non-null values. But... I still think in this case I am describing the scaling of SQL Server doing the wrong thing. ... with 72,048 X_1 rows and 32,000 X_2 rows requires only 1 millisecond of CPU time. Rather than 181641 ms of CPU time. That's a pretty hefty performance return for making an implicit filter explicit. The following work was performed in SQL Server 2014, with the 2014 compatibility mode set for the database. Further testing has shown similar behavior with the SQL Server 2012 compatibility mode, although thresholds for performance divots are different(much lower, actually). In tables A and B, the 'not_pk' column is a nonindexed, nullable column. Even though A.not_pk and B.not_pk may both have NULL values, rows with null values must not join in that query - the join carries an implicit NOT NULL filter for both columns: them's the rules. Lets start by creating two tables: a large X_1 table(600000 rows) and a smaller X_2 table(32000 rows). The code below might look a little intimidating, but the tables it creates are fairly simple. My colleague reproduced this situation we observed in the field before I was able to. The code below is actually a significant simplification of how he originally recreated the problem :-) Table X_1 has a monotonically increasing primary key in the first column. In the second column, every odd numbered row has a NULL value. Even numbered rows have row_number MOD 1024. The X_2 table has positive and negative integers in the first column as primary key. The second column is NULL for the whole table. Here's the code used to create the tables. This query looks simple enough. The query above consumed 1513643 ms of CPU time on SQL Server 2014 with 2014 compatibility mode! That's over 25 minutes! And almost all of the work was done by one of the parallel workers, so elapsed time was over 25 minutes as well! What about the three logically equivalent queries below? Wow!! 178 ms, 2 ms, 2 ms. I repeated several times to eliminate overhead from query plan compile, etc. So the original query took over 25 minutes - but making the implicit "IS NOT NULL" filter explicit cuts the time down to 2 ms! I had something else I wanted to learn from this adventure. These queries leverage hash joins. Many online sources send mixed messages about hash joins - at once lauding their scalability while warning they may not scale well. Well - what happens to CPU time accumulated when executing this query with different table sizes? I kept X_1 at 600000 rows, and experimented with the number of rows in X_2. The first graph below shows two different linear patterns for CPU time. At 20609 X_2 rows and above, CPU time accumulated according to the steeper pattern. At 17814 X_2 rows and below, CPU time accumulated according to the less steep linear function. This is a closeup showing the range where the two linear CPU time functions overlap, between 17815 and 20608 X_2 rows. 1. If you join NULLable columns, look out for this issue! 2. If you can't make SQL Server do the right thing - maybe you can make it do the other thing faster? That would depend on catching the lower slope function rather than the steeper function for CPU time. I'm doing some work with Microsoft's relatively new DiskSpd.exe. You can find this tool and documentation at the following link.